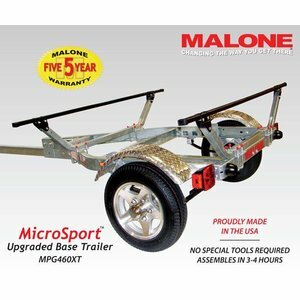 The MicroSport™ XT is an upgraded version of the popular MicroSport™ Base Trailer and includes the three top selling accessories at a reduced bundle price. 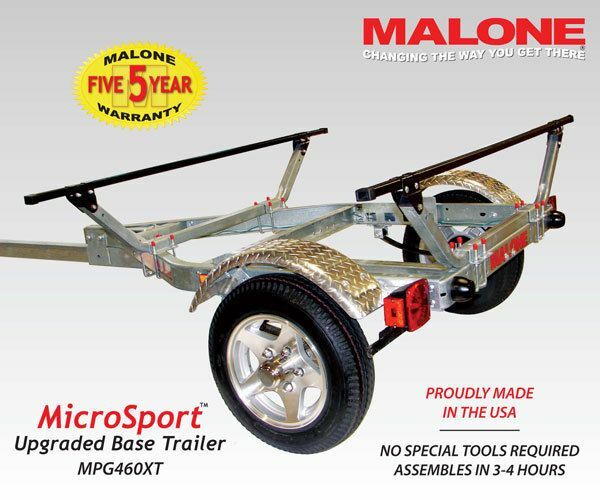 The XT has custom 12" aluminum spoke wheels and diamond plate aluminum fenders that enhance the overall street presentation of this trailer. The retractable tongue makes for easy simple storage. The 8' tongue can be unlocked and retracted in a matter of seconds. Got a space limitation? No problem. With the tongue retracted, the trailer can be stored vertically against a wall taking up less than 11 square feet of floor space. Like the MPG460G Base Model, the XT has DOT approved lighting and bearings, pre-tested electrical system, pre-fitted chassis components, 65" load bars, and assembles in less than three hours.